The Philips Allura FD20 and FD10 may be similar in appearance at a glance, but they are very different machines in a number of ways. The main difference between them is the work they are used for. The FD10 is primarily a cardiac system. It does have some options that may allow for light peripheral work, but cardiac studies are what it was designed for. The FD20 was designed, when equipped with the appropriate software, to handle a much broader spectrum of applications, including (but not limited to): angio, cardiac, neuro, and vascular. To keep you better informed about where each of these systems shines, we've compiled a short list of the most relevant similarities and differences between the FD10 and the FD20 below. The FD10 and the FD20 have very similar footprints and can fit in rooms of the same size. While both ceiling and floor-mounted gantries were manufactured for the FD10 and FD20, the vast majority are ceiling-mounted. Floor-mounted FD10 units are hard to find, and floor-mounted FD20s are exceptionally rare. • The Angio Diagnost 5 (AD5) table was the original standard table for the FD line. It features a motorized, floating top with table-side controls. The AD5 also has a variant that offers +/-17 degree tilt. • The Angio Diagnost 7 (AD7) was introduced in 2007. It's an upgraded version of the AD5, boasting most of the same features, with the addition of +/- 15 degree transverse cradle movement. AD7 tables have a tilting variant as well. In the procedure room, the geometry module controls the motion of the table and gantry. The imaging module controls the X-ray generator, the tube, and the detector collimation. The Xper module touchpad and controls (available in later renditions) allow for touchscreen and remote control of acquisition settings and imaging processing as well as optional modes of operation. The systems come standard with two LCD monitors on a ceiling-mounted boom that is capable of holding 4 to 8 monitors, depending on configuration and application. In the control room, there is a viewing console with one LCD monitor for viewing patient data and managing system information, a review monitor, and a review module that helps with exam viewing and post processing. You can also have a second Xper module in the control room for added flexibility. There are some slight differences in the movement and speed of the gantries. The FD20 is geared to be slightly faster in movement and more flexible in positioning to accommodate angio studies. These procedures need to cover a greater percentage of the body than those generally performed on the FD10, and the flexibility of the positioner is in keeping with those needs. The FD20 uses an MRC GS 0407 tube while the majority of FD10s use the MRC GS 0508 tube. The notable differences between these tubes are focal spot and heat dissipation. The focal spots of these tubes are different because of the size of the detectors they are paired with. The "0407" indicates that tube's 0.4/0.7 nominal focal spot values. The "0508" indicates its 0.5/0.8 nominal focal spot values. The heat dissipation rating of the FD20's tube is significantly higher than the FD10's to accommodate lengthy runs during angiography studies. The biggest difference between the detectors on these systems is their size, which, when measured diagonally, dictates the maximum field of view (FOV) each offers. The FD10, intended for cardiac use, has a max FOV of 10 inches. The FD20 has a max FOV of 19 inches. Another difference between the detectors on these two systems is that the detector (and collimator) on an FD20 can rotate. This allows for the best positioning for whatever the task at hand might be and, at least in part, accounts for the system's flexibility among specialties. 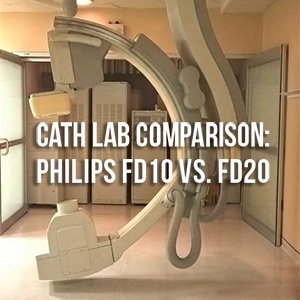 As you've probably gathered by now, if your facility will be performing a variety of interventional tasks, the FD20 is a system worth checking out. If your day-to-day is more often comprised of cardiac cases, the FD10 would be a better pick. If you're ready to begin a conversation about selecting your next cath/angio system, we're here to help inform your decision. Contact us with any other questions!